Girl's Trip 2018, Yes and Amen! I’m not sure if I can even do this justice but I just got back from the most amazing trip. 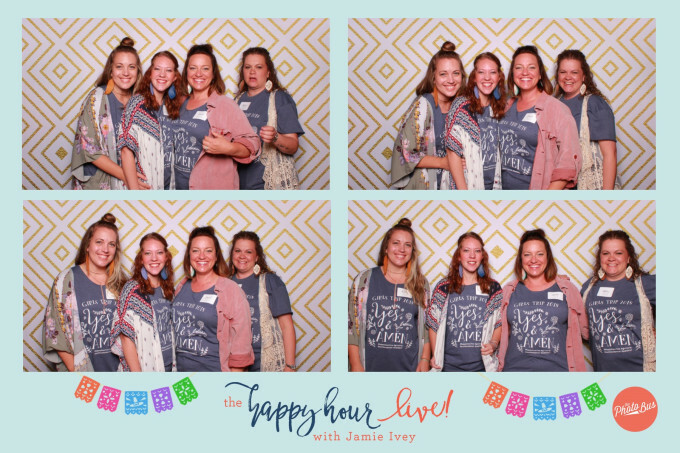 Me and my besties went to Austin for the Happy Hour Live event with Jamie Ivey. She has a podcast I love to listen to called The Happy Hour and she wrote a book we all love called If You Only Knew. Anyway it was the perfect opportunity to load up and head out. Leaving Rockwall turned out to be harrowing as we had torrential rain and the possibility of hail. Do you think that is going to stop us? NO! Plus I was driving Jesse’s truck so why do I care if it gets hit with hail. Pictured below are my friends Kelly (passenger seat), Cheryl (behind me), and Ashley (behind the passenger seat). Now here is the thing. You know I have to be honest about the trip right? Well the first thing that happened was Ashley ripped this door off the track. Like literally. Pulled it right off. Which started a phenomenon know as, “Don’t let Ashely open doors.” She somehow broke like 4 separate doors in all this weekend. I’m not sure what is wrong with her. Is it like a hulk thing? Is it a frustration thing? I don’t know. We took care of opening all doors. Next was dinner on a beautiful patio with my beautiful friends. I just love them. I also love my new top knot situation that we all agreed is good for me. It is also good because I can live with my bangs if I don’t have to deal with them everyday. I should pause and mention that I was the cruise director on this trip. I planned every minute of the trip because by spiritual gifting is bossiness. As it turns out this is a good thing because these jokers are ALL babies of their families. Everyone knows younger siblings can’t plan anything. I’m not sure if they liked all my plans because I never asked I just said, “Get dressed!” or “We are leaving at such and such time.” Cruise directors don’t ask you what you want to do, they tell you what to do so you have a good time. The end. For sure we must discuss the bat. We were enjoying our lovely fancy-ish dinner in the heart of the hill country when out of no where, I mean NO WHERE, this bat does a fly by and perches on the wall right by our table. Now Ashley and I pride ourselves on our animal understanding. We know that if there are sayings associated with animals you pay attention to them, because that saying came from some experience someone had with that animal. You know what saying is associated with bats? I’m quoting Ashley here: “Ever heard of the saying, Bat Out of Hell?” That’s right folks, bats for sure come from Hell. So guess what. Ashley and I are not going to fall victim to that flying rodent. We swiftly put our menu’s over our heads to protect our hair and brains. The other two are acting all PETA like. “Oh, stop, he is so cute. Why are y’all so scared of a bat?” Now, I would give one of my children to have a picture of this situation, but sadly I don’t have one because I was defending my life from Dracula. I am certain the wait staff at restaurant does. If you see a picture of 2 women with menu’s on their heads on someones social media let me know. All that to say, I yelled enough that Satan’s spawn flew away, back to hell. The next day we got to enjoy the spa area of the hotel. It was just what we needed. It was still raining so we got to sit in the covered area and watch it rain for a long time. It was quiet and peaceful and we all thanked God because He knew exactly what our hearts needed that morning. We praised Him because He always knows what we need. That night was the Happy Hour Live Event. First off, my friend Kelly designed these shirts we are wearing. Y’all, she is so talented. She nailed us to a T. We all try to live with a Yes and Amen kind of posture toward God. I think it is beautiful. It has to be said also that before the 4 of us left she sent them to another friend of ours, Stacy, who makes T-shrits and she printed them up for us. When we first got into the event there was a photo booth. I had to include the pictures of our time in the photo booth because never in the history of all photo booths have there been 4 women less clued into the timer on the photo booth. I kept yelling, “Make sure you can see your shirt!” Not until the end did we succeed. In the trying, we look like we are trying to touch things that should not be grabbed at a Christian event…….Kelly, what are you doing to Cheryl???!!!! After making quite an entrance we got to meet Jamie Ivey. Oh meeting Jamie Ivey. Here is the thing. I just love her. Listening to her podcast helped me learn what it was like to be aChristian woman who loves Jesus, walk the Christian life after I got home from Bible School. When I got home from Bible School all I wanted to talk about was the Millennial Kingdom, the Hypostatic Union, and the Dispensations of God. Now, for sure these are my still things I totally geek out over, but she helped me learn that you can have a relationship with Christ and still be free to laugh, buy hair products and talk about Jesus all the time. So did I share all this with her? No! I have had some bad experiences with meeting people I admire. We don’t have to go into them, but I was determined not to come home with a restraining order to my name. So as soon as I felt the tears well up, I stopped myself and said the only thing that came to mind…”Ashley is rebellious because I keep telling her to show her shirt and she won’t!” WHAT IN THE WORLD! I was like Baby in Dirty Dancing, “I carried a watermelon.” Oh my gosh. I’m so embarrassed. Then because I really wanted to communicate to her that I love her I am rubbing her back in all these photo’s. So yeah, I totally nailed meeting her. Ashley: I see you Ashley, running after the Lord. I see you holding your life up to scripture and rooting out the things that don’t line up. I see your heart for women who need support. I see your heart for Selah Creek. I love your determination and your drive to get’er done. I also love that you always, always have my back. 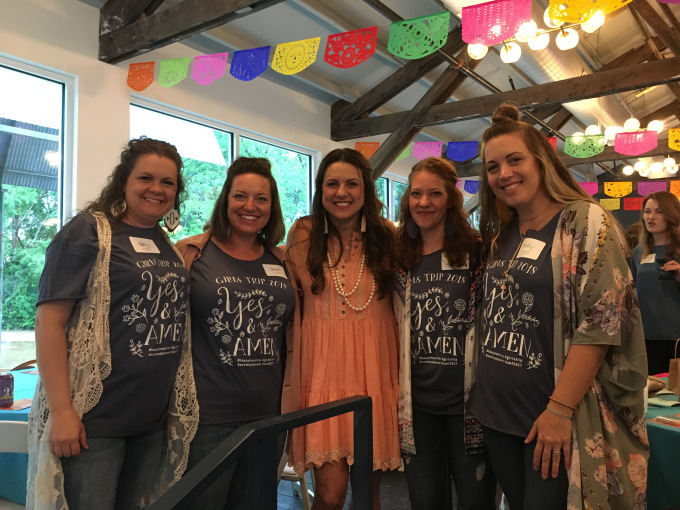 If you could see yourself through my eyes you would see a women who is passionate about the Lord, her husband, her family and teen moms who need support. Girl, I love you and somewhere between 90’s rap and Proverbs 31 is you. My life is better because you are in it, and I am thankful for you. Cheryl: I see you Cheryl, staring down fear and following God’s call. Good Lord, I love how kind and loving you are. When I need someone to feel something with me and tell me they are sorry for whatever it is, I call you. Nothing about what you are doing right now is safe or guaranteed, and yet you go on anyway. I wish you could see yourself through my eyes because you would see what an encouragement you are to me. Your drive to seek the Lord and bless others is amazing. You are the most non-judgemental person I have ever encountered. The way you love people right where they are at is amazing to me. I am so thankful for you, thank you for loving me well. Kelly: I see you Kelly, your weary body running after freedom. Not to be dramatic but I think of the dear panting for the refreshing stream of the Lord when I think of the journey you are on. You will not be quenched with lesser things, you are running after the ONE who will give you rest. If you could see yourself through my eyes you would see a woman rooting out the slave-masters that don’t give life and a woman passionate about loving others well. And because I am on a similar journey I thank God in heaven we get to do it together. Your servant’s heart is amazing to me. Your nature to let others go first, to serve others is inspiring to me. (I know I make fun of you for it, but its only because I am jealous of your willingness to take 2nd place.) All this in one person AND I get to teach women’s bible studies with you!! What a gift from God you are to me. I love you, girl. And an alpaca. This is what was funny with this though. Ashley and Kelly ran back to the room for something when we were at the spa. They came back and said, “There is an emu in the lobby!” I said really? And Emu? Why? They said, “Don’t know, this guy was leading it around and you could get a picture with it.” Then they said, “You, know its got a lot of hair and stuff.” I was like, “Do you mean a Llama?” They said, “Oh, yeah, it was a Llama.” When I saw it myself I knew it was an alpaca but who likes a know-it-all, right? Good call girls. One is a bird and one is a four-legged creature with hair. But whatever. Later, Kelly and Cheryl got a pic with the Emu/Alpaca. And just like that it was time to pack up and go. We had so much fun, we always do. It is so kind of the Lord to give us friends. Godly friends, to encourage you and point you back to the Lord when you lose your way. To encourage you to choose love and not anger. To enourage you to be yourself and not try to impress others. To encourage you to run after the Lord. I get so much from these ladies. They all pour into me. Do you ever feel like you could never repay someone for their kindness, yep, me too. Thats how I feel about them. Here is what I hope for you, who ever is reading this. I hope you have friends like this. I hope you have people around you that know Jesus and His truth. I hope they tell you that truth when you need it. I hope you invest in them too. Godly friendships are so important. Here’s how they start. Go to your local church. Get involved in something. Every church needs volunteers. (Check out the child care, every church needs grade school teachers because kids are just like puppies, after they turn 1-year-old, no body wants to deal with them because they lose their cuteness.) Invest in people. If you meet someone you hit it off with ask them to coffee. Take your time, get to know people slowly. It takes time to open up and share yourself. It takes courage to share the good, bad and ugly about yourself. There is freedom in relationships when you are really real with a godly friend. Beware of the fast friend, friendship takes time and commitment. Beware of people who don’t point you to Jesus. If you already have Godly friends be sure your friends can speak truth to you. With a personality like mine, people can not want to say hard things to me because of my affinity to throat punch and walk away. I have to be wise and submit (my favorite word) to things they need to say to me. They have to feel comfortable and like they can say stuff to me. Why? Because we all need someone to tell us if they think we are off base on something. God created us this way. I am expert at seeing other people’s sin, but when I look at myself I think I’m doing pretty darn well. So does it piss me off when these girls call me out on something? Yes! But I am learning that this is one of the ways God protects me from myself. Iron sharpens Iron remember? It can’t be one-sided either. They have to want to have truth spoken to them and you have to want to have truth spoken to you. It goes both ways or one of you is not really in it to grow in the Lord. Without these people in my life I would not be where I am with Lord because He has used them to grow me. Thankful heart and very thankful girl to have these ladies in my life. Here’s to many more Girls Trips……. Older PostI don't want to be a leech, but leeching is all I know.